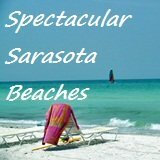 Sarasota Florida weather and what to expect during the year. Our Sarasota Florida weather is mixed: bright Florida sunshine mixed with warm temperatures. It’s a great combination. We have outstanding weather here most of the year; our average year-round temperature is 72 degrees. It really only gets super hot here from June through mid to late September. Eight months of the year are cooler and milder than the "dog days of summer." So you may be asking: "Depending on the weather, when is the best time of year to visit?" It’s a trick question. 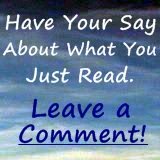 Because it depends on what your preferences are and your personal reasons for why you like a particular climate. For example, are you a camper? Tents and all that outdoors stuff? Well, do you like to camp in cooler weather or in the summer swelter? 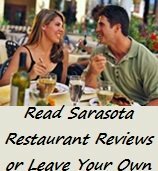 See, it really all depends on your preferences and what you want to do while you’re here and how important the weather in Sarasota will be to your planned activities. It really depends on you and your desires. Winters are usually mild with daytime highs in the mid-70s and normal overnight lows in the mid-low 50s, but it can get chilly if the region gets blanketed by a cold front from the north. At those times the overnight temperature can dip into the upper 30s and on the rare occasion close to the freezing mark. That’s when orange growers put smudge pots in the orange groves and when Sarasotans put smudge pots in their living rooms! But that’s a rare occurrence, although for the first time in years the Orlando, Florida area recorded a trace of snow flurries in November of 2006. This was due to a rare early season cold front from the north. I think the last reported appearance of snow in the Sarasota area was circa 1980. 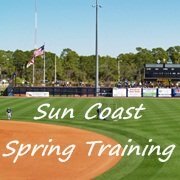 This cooler climate of mid 70’s temperatures prevails in the Sarasota Florida weather forecasts from around December to March and into April, when weather in Sarasota starts to warm up. Overall, milder Sarasota Florida weather lasts from around the first of October until May. It’s what brings the “snowbirds” from the north every fall until around Easter time. As mid May approaches the Sarasota Florida weather changes to one of a sub-tropical nature and by early June the humidity sets in, coupled with high temperatures, creating a steamy environment. There’s nothing like a hot, steamy day at the beach. By mid-April water temperatures off the Sarasota barrier islands can reach 82-85 degrees and by August the waters of the Gulf of Mexico are almost bubbling as the temperature approaches 88-89 degrees. In fact you can stand waist deep in the water, put your hand over the breaking waves and literally feel the heat radiating off the ocean. Quite a phenomenon! 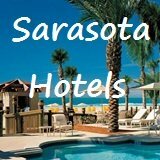 Sarasota summers are for those who like hot, steamy, sub-tropical weather and there’s no more beautiful place to enjoy that kind of climate than here. The days are so beautiful that it makes you want to take off your skin and run around in your bones! Now mind you, the heat and humidity are often times tempered by warm sub-tropical breezes off the Gulf of Mexico, creating a summer in paradise. The evenings can remain steamy, but again, if there’s a nice tropical breeze coming in off the Gulf of Mexico, it’s quite tolerable! The summer is also known as rainy season. We may get an afternoon thunderstorm somewhere in the Sarasota area every afternoon due to the combined building through the day of high humidity and high heat. But the storms are widely scattered and you can see them developing from miles away over the Gulf and to the east over the center of the state of Florida. This is truly an awesome sight of nature to anyone who loves to watch the weather. And the raindrops from these storms can be the size of canned hams, to borrow a phrase from comedian David Letterman! Perhaps you’ll see one of these storms develop or watch, as I have, the birth, life and death of a water-spout out on the Gulf of Mexico, a mile offshore, while you’re lying on the beach soaking up rays. The good news is that the afternoon storms last for only a short time. Then it dries up and it’s time to go out for dinner at a fine restaurant. 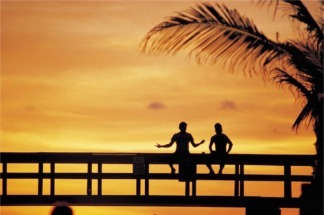 After dinner it’s back to the beach for a romantic sunset over the Gulf of Mexico and then on to the rest of a fine evening with warm temperatures and palm trees gently swaying in the balmy gulf tropical breezes. 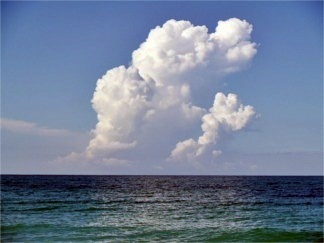 If you come to Sarasota in the summer you’ll find that thunderstorms frequently pop up in the afternoon. If you find yourself outdoors while one develops you should seek shelter immediately. 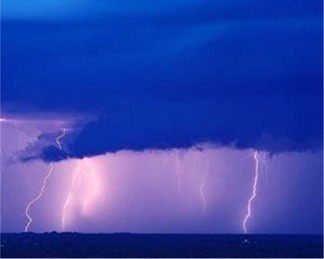 Florida leads the nation in lightning injuries and deaths with 2,117 recorded from 1959 to 2004. The thing about thunderstorms and lighting in Florida is that they can develop quickly and they seem to be closer to the ground. I’ve been stuck in and close to storms in which the lightning and thunder occur at the same split-second. It’s a large bang. It sounds and looks like it’s right on top of you, because it can be so low to the ground. Florida weather history and record keeping tell us that most lightning injuries and deaths occur in July and August. If you’re outside, find shelter in a building or a car. If no shelter is available, go to a low-lying open area, away from tall or metal objects. If you’re in the water, get to land. If you’re in the woods, stand under short trees. If you’re inside, don’t use wired telephones or electric appliances. Don’t bathe, shower or touch water running from a faucet. 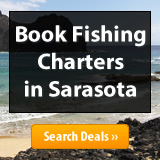 Those are good tips to keep in mind not just on your trip to Sarasota, but for anywhere else as well. 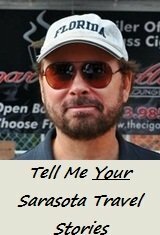 What about Hurricane Season in Sarasota? Sarasota Florida Weather also includes Hurricane Season which runs from June 1 to November 30, with the peak of the season around the first week of September. Though forecasters try to predict these monster storms as far as 6 months in advance, they don't have a very good track record the past few years. No one can really predict what the outcome of hurricane season will be, until it’s over. More about hurricanes, forecasting and Sarasota weather. Sarasota Hurricane History: Sarasota County recorded a hurricane's direct hit in 1944 when the eye of a Category 3 storm moved through north Casey Key and Osprey. 2004...A Hurricane Season To Remember! Charley, Frances, Ivan and Jeanne would all pay us unwelcome visits in 2004. One of the most active storm seasons ever recorded, these hurricanes all had a lasting effect on Florida and the gulf coast. The storms were forming so rapidly that Floridians barely had a chance to catch their breath from one storm to the next during the summer of '04. Here's more about Hurricanes Charley and Frances. Speaking from first hand experience I can tell you that Sarasota Florida Weather is GREAT most of the year!